We all scream for ice cream. I’m not a huge sweets person (salt is my poison) but I’m a sucker for good ice cream. And I can now say I have found (actually my husband gets the credit) the best ice cream I have every had (not including Benny & Caesar’s, mentioned a couple of weeks ago, which I haven’t personally tried yet). If you happen to be in Connecticut for any reason, you really need to make an excursion to Newtown – about an hour northwest from downtown Stamford. 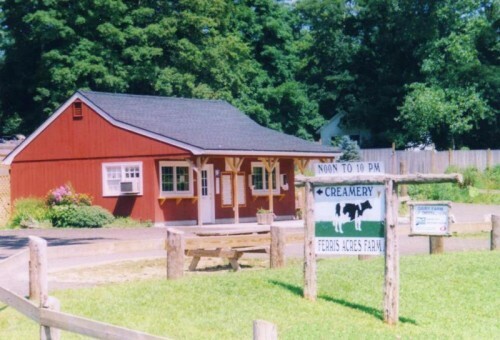 This is probably more desirable while it’s still nice weather because the Ferris Acres Creamery is located on the last working dairy farm in Fairfield County. It’s a pretty drive and is a great trip to take with the kids – they can see the cows etc. Their ice cream is made fresh daily in tons of flavors from the basics to more exotic varieties including everything from Campfire (vanilla ice cream with fudge swirls, graham cracker pieces and mini marshmallows) to Elvis’ Dream (vanilla ice cream with peanut butter, banana pieces and dark chocolate chunks) to the best coffee almond fudge I’ve ever tasted. They will of course hand pack you pints or quarts to bring home (my husband brought a cooler for his second trip)! Truly the quintessence of what ice cream should be. This entry posted in children, food and drink, travel. Entry Tags: Ferris Acres Creamery, Ice Cream, Things To Do In Fairfield County Bookmark the permalink. It is a little too divine – you’ll love it! 81 queries in 0.368 seconds.